The British nurse who contracted Ebola in Sierra Leone remains in a critical condition, while health officials have drawn up new guidelines on how to manage cases of the virus in the UK. Volunteer nurse Pauline Cafferkey, 39, contracted Ebola while working in Sierra Leona for three weeks at the British-built Kerry Town hospital, which is run by Save the Children. She was diagnosed with Ebola a week ago and is now being treated at the Royal Free Hospital in north London. The charity’s Sierra Leone director, Rob MacGillivray, told the BBC: “We are constantly reviewing our protocols and procedures to ensure staff working in the Kerry Town center and outside take all measures possible to prevent themselves becoming infected with Ebola. The Royal Free Hospital issued a statement Saturday afternoon, saying that Cafferkey is now in critical condition. Cafferkey had returned to the UK on 28 December. She had been cleared to return home to Glasgow after her temperature was checked seven times. However, she was diagnosed with Ebola the following morning. More than 20,000 people have been infected with Ebola in this epidemic and 8,000 have died, according to the World Health Organization (WHO). As of December 31, 2014, confirmed and suspected deaths in the three worst-hit countries, Sierra Leone, Liberia and Guinea, had reached 7,989. The current outbreak has also claimed around 15 lives elsewhere. The Ebola virus causes a form of hemorrhagic fever and can be transmitted through bodily fluids such as blood and sweat. The guidance from Public Health England (PHE) states that the remains of Britons with the disease cannot be repatriated back home for burial, but must be cremated abroad. UK Prime Minister David Cameron said that he is considering implementing a quarantine system for returning health workers, as it can take up to 21 days for the virus to incubate. Cameron told BBC1's Andrew Marr Show: “The thing uppermost in my mind today [is Ebola] with Pauline Cafferkey in hospital, and all of us are thinking of her and her family. Cafferkey’s is the second UK case of Ebola after nurse William Pooley, 29, contracted Ebola while volunteering in Sierra Leone last August. 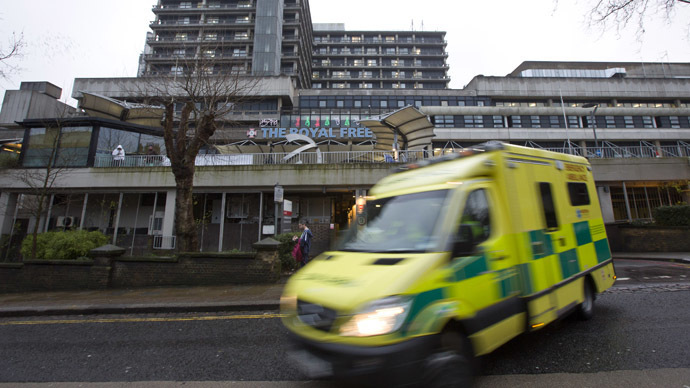 The Royal Free Hospital, where Cafferkey is being treated, was unable to obtain ZMapp, the drug used to treat Pooley. She is reportedly being treated with an experimental anti-viral drug.